Two very special ladies in my life are expecting their first child this Spring! For their Christmas gift, I concocted a luxurious belly that they can use to prevent those much-dreaded stretch marks (and to help them relax and feel pampered). After a bit of research and experimentation, I came up with a wonderful blend of botanical oils that have healing, moisturizing, and antioxidant properties. I also added a touch of lavender, which is known to have healing properties and is the safest essential oil for use during pregnancy. * Most of these oils can be found at your local health food store or natural market. I also order many of my carrier oils from Synergy Essentials online. The recipients seem to love the final product, so I thought I would pass along the recipe. Here is my final blend — enjoy mamas! Sunflower oil [High in Oleic acids, plus significant quantities of vitamins A, D, and E]. Sesame oil [Natural anti-bacterial and antioxidant]. Argan oil [Rich in many important antioxidant compounds, including vitamin E and other polyphenols]. Jojoba oil [Moisturizes and absorbs easily]. Rosehip oil [Positively researched in controlled studies for reduction of appearance of wrinkles and fine lines, and general improvement of skin texture]. Apricot Kernal oil [Extremely healing for dry skin]. Sweet Almond oil [Softens, smooths, and conditions skin. Rich in fatty acids]. Liquid Vitamin E [Diminishes the appearance of scars and evens out skin tone]. You could also swap or include the following oils if you have them on hand: Rice Bran oil, Calendula, and Wheat Germ oil. Then add 10 or more drops of Lavender Absolute oil or Lavender essential oil (I prefer the absolute — it has a richer, more balsamic scent than the essential oil). If you would like a lighter fragrance, add 10-15 drops to your oil mixture. If you prefer a stronger fragrance, you can add more to your liking. Shake well, and you’re done! 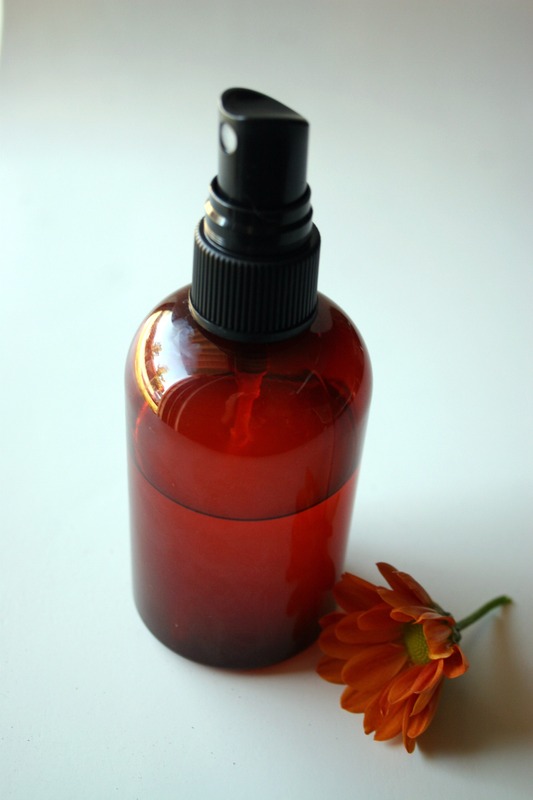 I put mine in an Amber glass dropper bottle to keep it fresh and to make application easier for the moms-to-be. To apply: Add a generous amount to the palm of the hand and massage into the skin morning and night until moisturized. Mothers can continue using the oil for several months after giving birth to help the skin regain elasticity and stay moisturized — this speeds up the healing process. 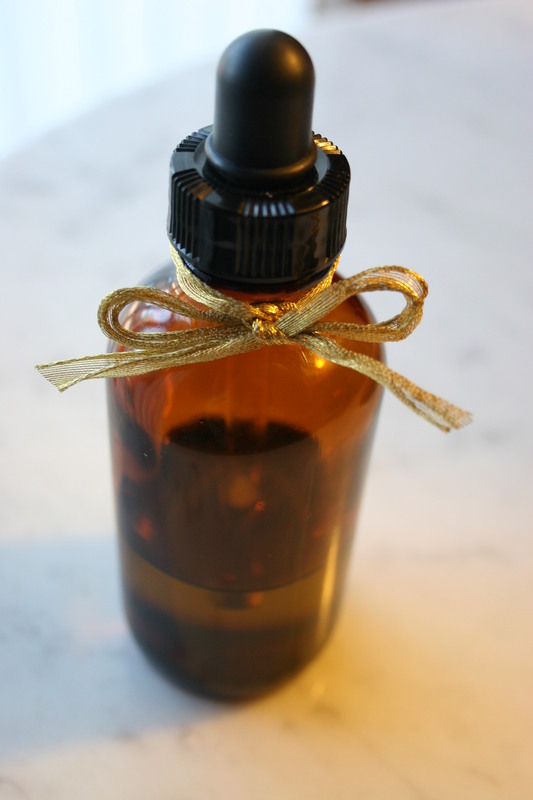 If you are expecting, why not blend your own batch of belly oil? You have complete control over the ingredients (no nasty chemicals or hidden additives) — and you can personalize it according to your own preferences. This also makes a spectacular gift for baby showers! *Please note: Essential oils are not recommended for use in high doses during the first trimester of pregnancy. 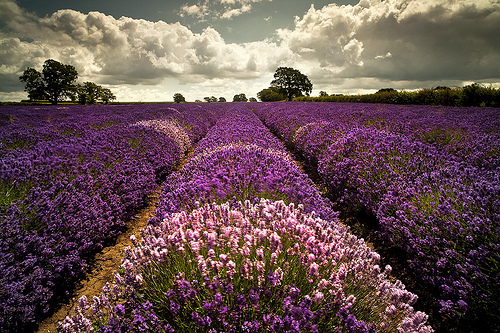 For a well-researched article on the safety of lavender oil, refer to this article by Robert Tisserand. P.S. Another awesome thing about this oil — you can use it even if you’re not expecting. I have been using it on my face as a moisturizer at night and adding a few drops to the ends of my hair to help smooth frizz after I shower. It works wonders! This holiday season, visions of nature’s bounty are dancing in me head. Here is a botanical-inspired collection of gifts that would perfect for the nature-lover in your life (all items are hand-made and under $75, to boot!). 1. Rustic Vase for 4 Flowers by The Bent Tree Gallery, $36. 2. Pure soy candle with essential oils. SPA (sweet birch, cedar, black pepper, orange) by Luminology, $44. 3. Christmas decorations balsam pillows. hanging ornaments with pine imprinted in chocolate brown on cream linen by Studio Botanica, $40. 4. Botanical Nature Photograph, Winter Rustic Frosted Rose Hip by Mary Foster Creative, $25. 5. Ceramic Eco-Friendly Travel Mug – Cyclamen, Botanical Collection by Yevgenia, $44. 6. Flossie in a Jar Gift Pack: Lost in the Forest dry shampoo, salt soak, lip balm by Flossie Fern, $30. 7. Organic Vegan Vanilla Bean-Infused Sugar by Twig and Leaf Botanical, $7. 8. Pressed Leaf Necklace Botanical Jewelry by Katee Marie, $28. 9. Myrtle Branch Curvy Bracelet in Gold by Shlomitofir, $63. 10. Autumn Tea Towel by Bookhouathome, $16. 11. Branch Pod Air Plant Terrarium by Sea and Asters, $25. 12. Organic Bath Salts, 4 Test Tube Sampler by Khushi Organics, $10. 13. Luciana bouquet earrings by The Don Juan Legend, $11. 14. Antler No. 7004 original photo print by Kari Herer, $30. 15. Antique Botanical Print of Pink Carnations by We Sell Used Gods, $24. 16. Gold Pinecone lariat necklace with smoky topaz by Otis B. Jewelry, $36. What is on your wish-list this year?? Shop Update & a Roll-On Bottle Giveaweay! I’m thrilled to introduce these lovely new roll-on perfume bottles with elegant silver caps — each one holds 8 ml of your favorite Plume perfume oil. I have been testing them out to be certain they are spill-proof, and so far they have held up wonderfully in my purse! 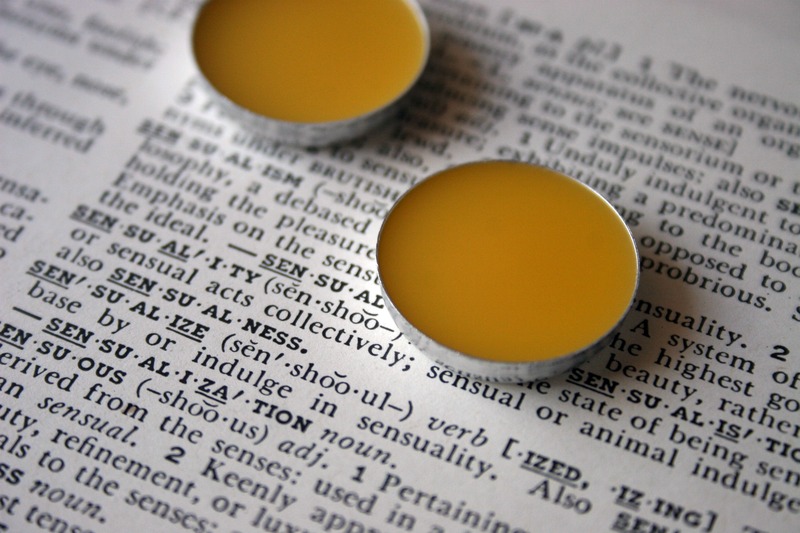 I love having the choice between applying oil or solid perfume when I’m out-and-about (I’m a little addicted to re-applying!). As part of Plume’s holiday/Cyber Monday specials, if you purchase one of the new roll-on perfume oils between now and Monday, Nov. 28th, you receive a free mini perfume of your choice! To celebrate the release of the new bottles, I’ve decided to have my first-ever giveaway here on the Plume blog. 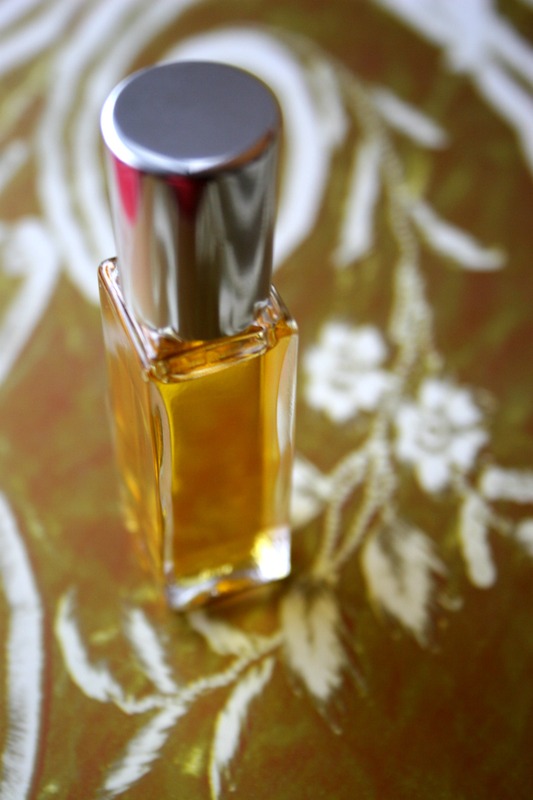 I will be giving away one full-size roll-on bottle of perfume oil. The winner gets to choose the scent they would most like! The giveaway ends on Saturday Dec. 3rd. The winner will be chosen at random. Visit the Plume Perfume Etsy shop and then share in a comment (on this post) which item you like the most! Please include your first name (or Etsy username) and email address. For 2 additional entries, blog about this giveaway and leave the url for your post in a comment. Please let me know (in the comments) which of the above additional entries you made. Holiday Weekend Deals & Specials! I don’t know about you, but I’m all about avoiding the Black Friday craziness at the big-box shops this holiday weekend! Whether you’re participating in Black Friday, Small Business Saturday, or Cyber Monday, Plume has some great deals and specials to help you kick off your holiday shopping with style — and without the stress! Free shipping in the Etsy shop using the coupon code FREESHIP at checkout. 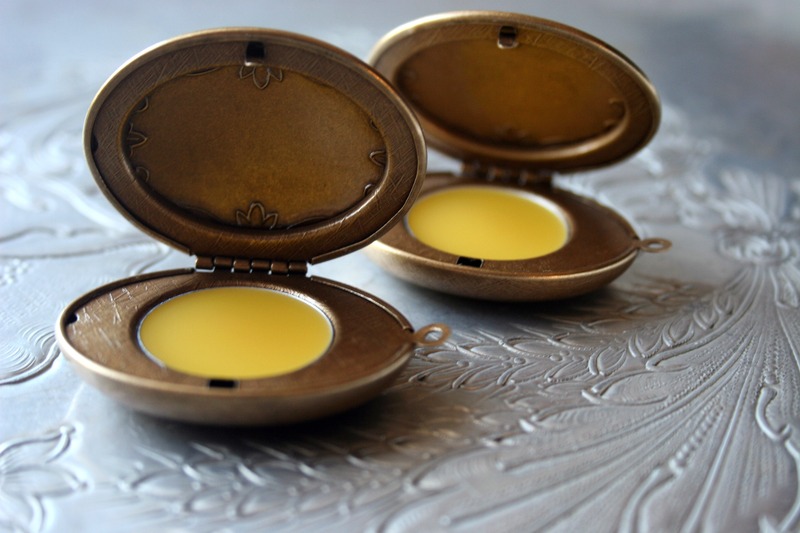 A $5 Gift Certificate toward a solid perfume refill pan when you purchase one of Plume’s brass refillable perfume lockets. A FLASH SALE on all full-size solid perfume tins — marked down from $28 to $24! As a special “Small Business Saturday” event, I will be revealing my new 8 ml. 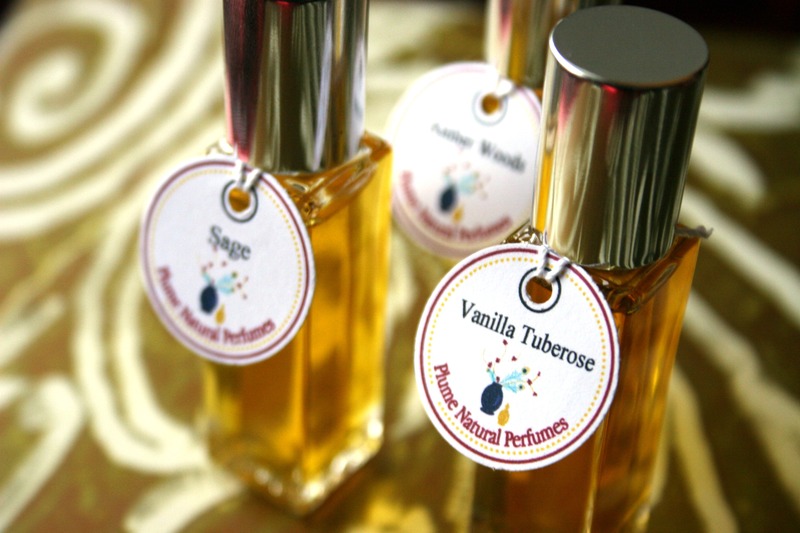 perfume oil roll-on bottles in the Etsy shop! Check back here on Saturday for a great giveaway, as well!! Happy Holidays, my friends — may the rest of the year be filled with peace, happiness, and beautiful smells! 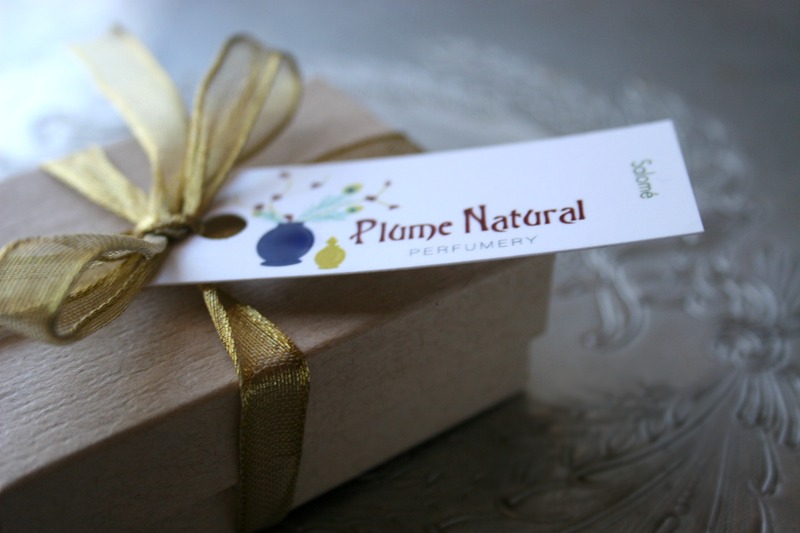 Shop Update: Newest Addition to the Plume Perfume Locket Collection…and a Holiday Offer! 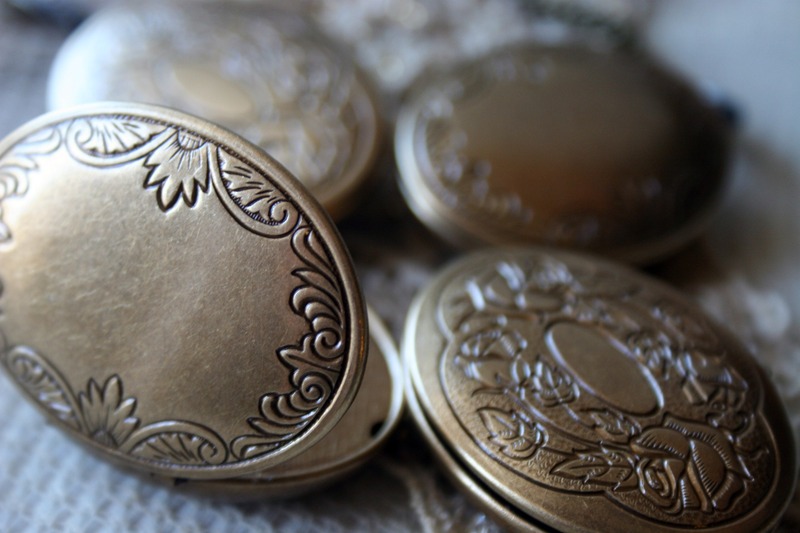 These lovely lockets are specially-crafted to hold solid perfume. They have a small removable refill pan inside, so when you run out of solid perfume, you can order a new pan to place inside. Voila! You can always have your favorite scent with you. I couldn’t be more pleased with the quality of these lockets — they are crafted in the USA from original vintage molds and then plated in antique-finish brass. Each one comes with a matching brass chain, so it is ready to wear when you receive it. I have been wearing mine every day — it seems to add just the right touch to every outfit! HOLIDAY SPECIAL: Order one of the brass, refillable lockets before December 25th and receive a $5 gift certificate toward the purchase of a refill pan. 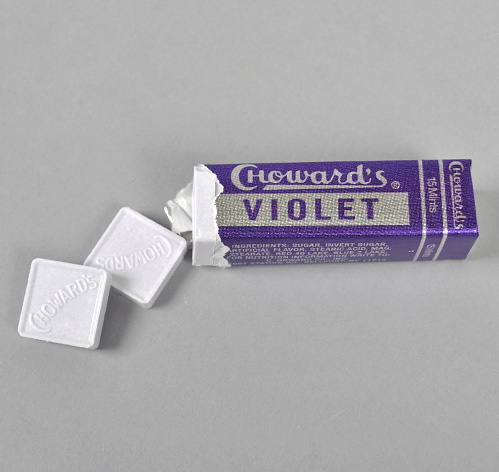 My obsession with old-school candies started a few months ago when I tried Choward’s purple wafers for the first time. It was a confusing sensory experience that was neither pleasurable nor entirely off-putting. It was — I imagined to myself — very much like eating a violet plucked straight from the garden, albeit crunchy. It reminded me of the first time I tried rose ice cream. I wanted to love that beautifully-scented, pink ice cream — but I didn’t. There was a disconnect between my nose and tongue that I wasn’t expecting, as if some primal switch came on in my brain that said “this is not edible!” But, I am not one to give up so easily — I am determined to appreciate both the Violet candies and the rose ice cream! While it seems most people readily accept perfumes and fragrances with edible aromas (this is obviously a HUGE trend in the fragrance industry in the West), we are somewhat less open to the idea of eating things that have a direct connection with perfume fragrances — namely flowers or floral-scented edibles. After considering my ice cream experience again, I realized that the reaction was probably far more cultural than primal. Flowers are not part of our regular, everyday fare in the West. Flowers, for the most part, go in gardens and not on our plates. Of course this distinction is not so clear-cut in other parts of the world (rose ice cream is common in the mid-east, for example) — and there are plenty of flowers that are perfectly edible. Sampling the Violet candies piqued my curiosity about the ways different cultures distinguish between those things which are considered OK to smell, but not OK to eat. I also learned that it has really only been in the past 50 or 60 years that we have become less accustomed to floral-based or “perfumed” edibles. In fact, floral ice creams and candies were quite popular during the 19th century and early twentieth centuries in the US and Britain (The violet candies are a case-in-point). 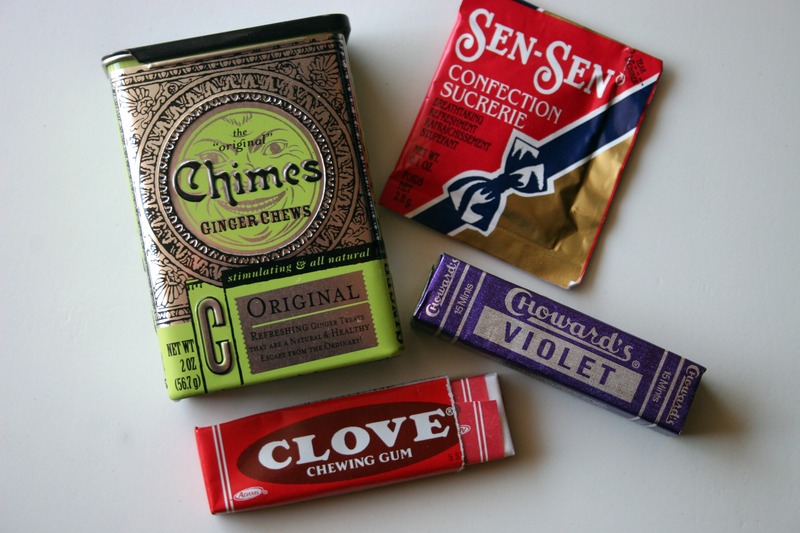 Folks seem to have been much more flexible in their notions of what their sweets could smell and taste like. 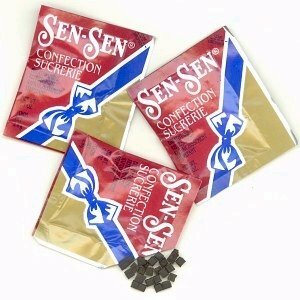 Another obvious example of this is the most bizarre candy of them of all: Sen-Sen — a “breath perfume” that was invented in the 1890s. I hunted down a package of Sen-Sen after reading about the ingredients, which include: patchouli, geranium, ionones, orris extracts, nitromusks, anise, and clove, among others. That list read more like perfume notes than candy ingredients, so of course I was fascinated! The taste of Sen-Sen was…shocking…to say the least. That seemingly primal voice kicked in again: “This tastes like soap-on-a-rope…spit it out!” Oddly, Sen-Sen does smell wonderful, but I just couldn’t get past the perfume-like quality (the texture is bizarre, as well). This really has me wondering whether or not we can train (or re-train) ourselves to enjoy and appreciate these perfume-y tastes again, or whether it is simply a thing of the past. I, for one, am going to continue on my strange little obsession for a while — mainly because there is at least one more unusually-flavored candy that I really must try (yes, I am a glutton for punishment): Musk Lifesavers! Yep. These are apparently an Australian confection, and they sound too bizarre to be true! Have you tried any of these unusual candies? What was your impression? 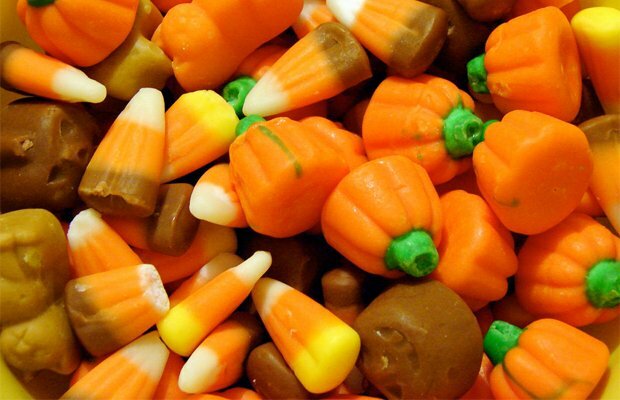 All the hubbub around Halloween-time makes me crave candy, candy, candy! I thought it would be fun to experiment with Halloween candy-inspired scents, and I came up with two recipes that feature a classic candy ingredient: Anise oil. 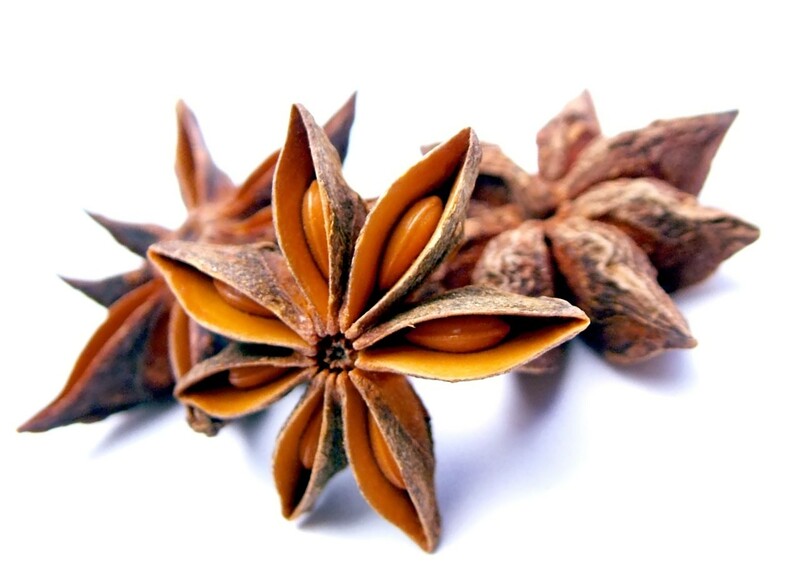 To me, there is just something about Anise that screams Halloween — I think it has to do with its sweet, spicy fragrance and strange, sinister appearance. Directions: To 4 oz of distilled water (in a dark-colored spray bottle), add 42 drops of Anise essential oil and 6 drops of ylang Ylang Extra Essential oil. Shake well each time before use. 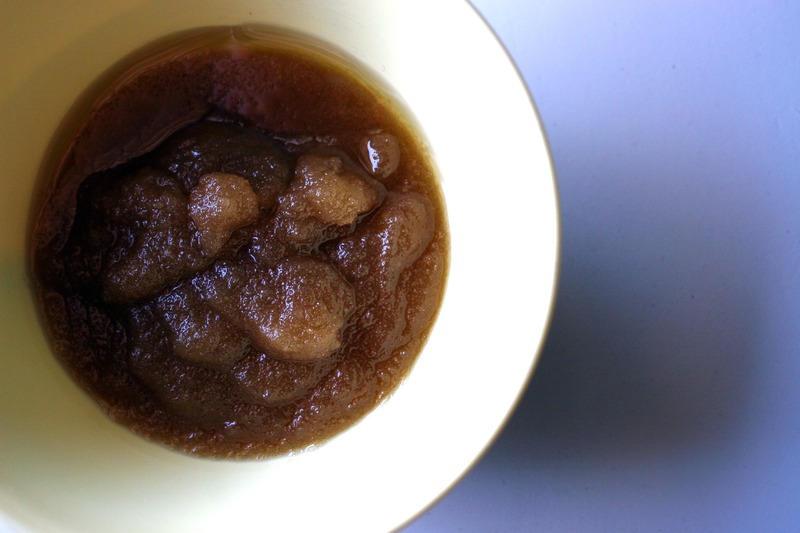 The next recipe is for a delicious-smelling sugar-scrub. The blend of Anise, cocoa, and cinnamon is irresistible! Be sure to dilute the cinnamon oil before using it, as it can cause irritation when undiluted. Use this to soften and smooth rough skin on your hands, feet, and elbows. Directions: In a mixing bowl, stir together 40 ml of sugar, 30 ml of your chosen oil, 9 drops of Vitamin E, 20 drops of Anise, 18 drops of cocoa, and 4 drops of diluted cinnamon oil. Blend well until the mixture becomes an oily paste. Store in an air-tight container. Enjoy your sweet treats, my friends! I hope your week has started off well! I am dropping in to tell you about two recent changes at Plume Perfume (one exciting change…and one necessary change). First, Plume has a new website…well, it’s the same web address, but with a different look. I wanted a web home-base that would offer a more comprehensive array of links and information about the company. I’ve added links for retail locations, testimonials, press features, wholesale info, and more. I would love to hear what you think! I created the site through indiemade.com — a great little platform for artists and indie business owners. I highly recommend it if you are a small business and do not have the money or means to design your own site from scratch (like me!). Let me know if you have any questions or comments, friends. Have a great week! P.S. If you haven’t signed up for the Plume newsletter yet, now is a great time to do it — newsletter subscribers receive a FREE SHIPPING coupon code for the Etsy shop, good through the end of November. Shop Update: Lockets and Lip Balms – Oh, My! The Plume shop has two new locket designs available in vintage silver or brass finish. Each locket is filled-to-order with the solid perfume of your choice (choose from any of the current ten available in the shop). I really love the antique-inspired floral design on these! They are perfect to wear with Fall dresses, silky blouses, and soft sweaters. The new lockets come on a matching antique-finish 28 cm chain with a lobster-clasp closure. These perfume lockets are an elegant way to wear fragrance — the warmth from your body allows the subtle perfume to surround you throughout the day. Also, just in time for chapped-lip season: Plume’s new Botanical Lip Crèmes are finally available in the shop! Choose from three scents: Vanilla + Anise (my current favorite), Ginger + Rose, and Cocoa + Orange. You can also purchase all three in a gift set! I just started reading A New Earth by Eckhart Tolle (again), and the first chapter really struck a cord with me this time around. Tolle believes that flowers played an essential role in the evolution of human consciousness — inspiring countless artists and philosophers to contemplate the meaning of beauty over the centuries. I feel honored that my work as a natural perfumer is connected to the sacredness of flowers — their precious, fragile nature is an inspiration to me… I wanted to share this excerpt from Chapter 1 of A New Earth by Eckhart Tolle: “The Flowering of Human Consciousness.” I hope it inspires you as much as it did me! “Earth, 114 million years ago, one morning just after sunrise: The first flower ever to appear on the planet opens up to receive the rays of the sun. Prior to this momentous event that heralds an evolutionary transformation in the life of plants, the planet had already been covered in vegetation for millions of years. The first flower probably did not survive for long, and flowers must have remained rare and isolated phenomena, since conditions were most likely not yet favorable for a widespread flowering to occur. One day, however, a critical threshold was reached, and suddenly there would have been an explosion of color and scent all over the planet—if a perceiving consciousness had been there to witness it. Much later, those delicate and fragrant beings we call flowers would come to play an essential part in the evolution of consciousness of another species. Humans would increasingly be drawn to and fascinated by them. 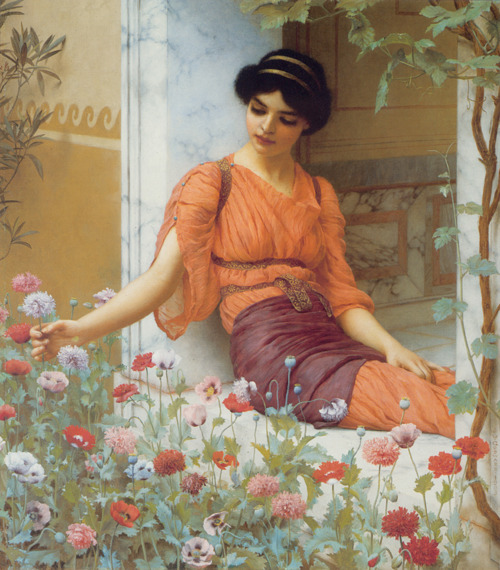 As the consciousness of human beings developed, flowers were most likely the first thing they came to value that had no utilitarian purpose for them, that is to say, was not linked in some way to survival. 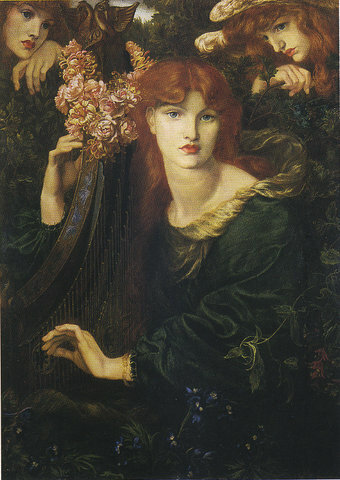 They provided inspiration to countless artists, poets, and mystics. 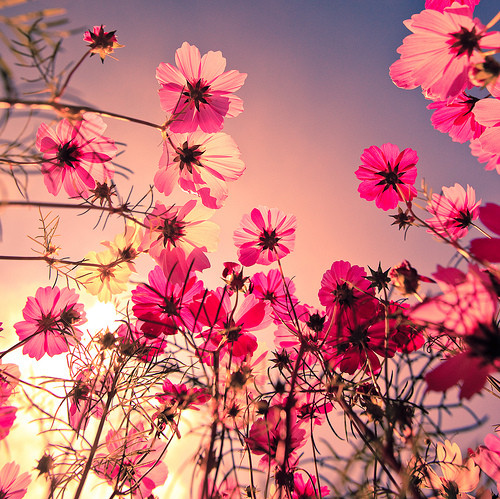 Jesus tells us to contemplate the flowers and learn from them how to live. The Buddha is said to have given a “silent sermon” once during which he held up a flower and gazed at it. After a while, one of those present, a monk called Mahakasyapa, began to smile. He is said to have been the only one who had understood the sermon. According to legend, that smile (that is to say, realization) was handed down by twenty-eight successive masters and much later became the origin of Zen. Seeing beauty in a flower could awaken humans, however briefly, to the beauty that is an essential part of their own innermost being, their true nature. The first recognition of beauty was one of the most significant events in the evolution of human consciousness. The feelings of joy and love are intrinsically connected to that recognition. Without our fully realizing it, flowers would become for us an expression in form of that which is most high, most sacred, and ultimately formless within ourselves. Flowers, more fleeting, more ethereal, and more delicate than the plants out of which they emerged, would become like messengers from another realm, like a bridge between the world of physical forms and the formless. They not only had a scent that was delicate and pleasing to humans, but also brought a fragrance from the realm of spirit. Using the word “enlightenment” in a wider sense than the conventionally accepted one, we could look upon flowers as the enlightenment of plants. Since time immemorial, flowers, crystals, precious stones, and birds have held special significance for the human spirit. Like all life-forms, they are, of course, temporary manifestations of the underlying one Life, one Consciousness. Their special significance and the reason why humans feel such fascination for and affinity with them can be attributed to their ethereal quality. Once there is a certain degree of Presence, of still and alert attention in human beings’ perceptions, they can sense the divine life essence, the one indwelling consciousness or spirit in every creature, every life-form, recognize it as one with their own essence and so love it as themselves. Until this happens, however, most humans see only the outer forms, unaware of the inner essence, just as they are unaware of their own essence and identify only with their own physical and psychological form. 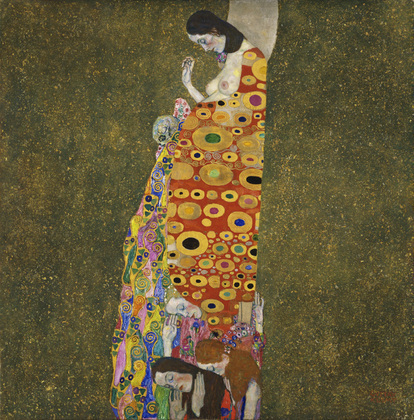 In the case of a flower, a crystal, precious stone, or bird, however, even someone with little or no Presence can occasionally sense that there is more there than the mere physical existence of that form, without knowing that this is the reason why he or she is drawn toward it, feels an affinity with it. Because of its ethereal nature, its form obscures the indwelling spirit to a lesser degree than is the case with other life-forms.